Sometimes it’s hard to find inspiration, y’all. I search and search and scour and scour and come up with… nada. And when it’s hot, I pretty much am incapable of doing… nothing. No wait. That’s not true. Here is my list of Things I Can Do When It Is Hot: Complain, whine, complain, sweat, whine, sweat, sweat, sweat, use all of my effort to pull on a pair of shorts, feel gross because I can barely pull on said pair of shorts, sweat some more, beg for the AC, realize I could never survive anywhere where there is sun, browse one-way tickets to Seattle, sweat, complain. When I’m stressed and feeling uninspired, baking is usually my go-to therapy (besides shopping, but that usually leaves me buying five pairs of flats in 24 hours. No. Joke. Ugh). 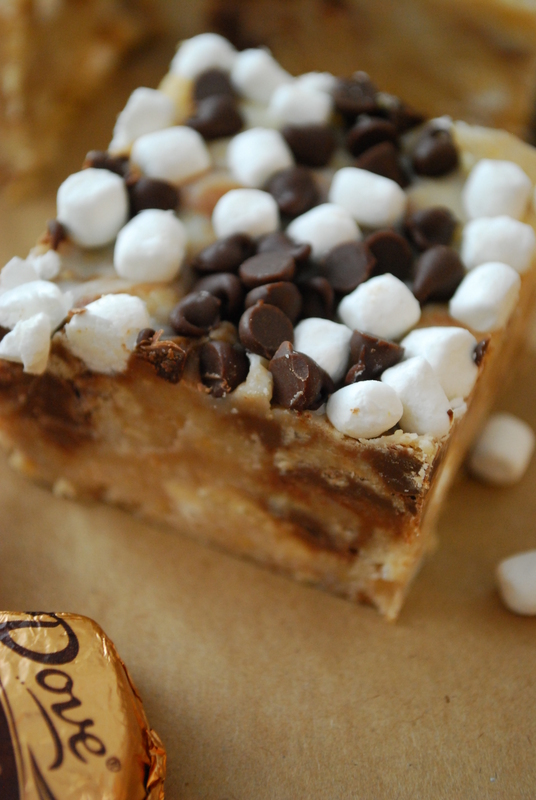 Enter these No-Bake S’mores Bars. They’re equal parts magical, no-bake, tasty and easy, without sweating your parts off or turning on your oven. No whining, no fuss, and certainly no muss. In other news: I am now a magical baking scientist. 1. Line an 8×8 inch pan with foil, extending the sides over the edge of the pan. Lightly mist the foil with cooking spray and set aside. 2. In a large bowl, microwave the white chocolate chips for 45 seconds and stir until melted. Pour in the can of sweetened condensed milk to combine. Lastly, stir in the crushed cookie crumbs, chopped chocolates and one cup of the mallow bites to incorporate. 3. Spread the mixture evenly into the prepared pan. Sprinkle the top liberally with the remaining mallow bites and the mini chocolate chips. With your hands or a greased spatula, gently press the toppings into the bars. 4. Allow the bars to set for about 30 minutes-1 hour (I sped it up in the fridge) before cutting into squares. Store airtight for up to 2 days. 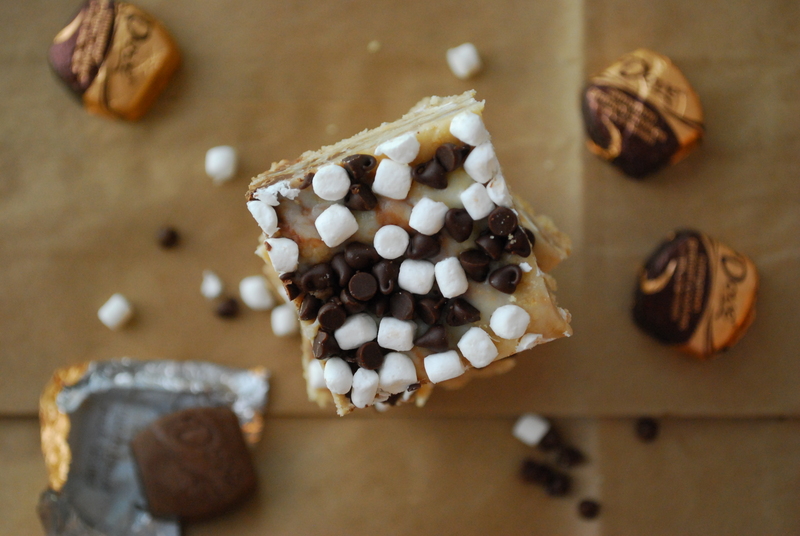 I was surprised at how simple these were to throw together… and how they tasted just like s’mores! Last minute campers/anti-campers: this is for you. Who doesn’t need 5 pairs of flats???? I don’t get it? If I go to shopping for therapy, it works great until the guilt kicks in. Then I need therapy for that. LIke you, I turn to baking. I like the no bake treats. Sometimes it really is too much effort to turn on the oven. Yes–retail therapy needs post-retail therapy. Funny how that works out–more flats? Methinks yes 🙂 thank you! Golden Oreos rock and so does everything else about these – love it all!! And Cinnamon Graham chocolates? Where have they been all my life?! I was shocked to see them, too! Dove makes some really awesome flavors I didn’t notice before–this was one of them! Seriously, those scientists have their priorities all wrong! I love that these bars contain no muss…hate muss filled food. Thank you for your magical ways and for inspiring me to make these. They look SO good! I can’t wait to go shopping with you! Me either! OMG I’m STOKED. I want to book my Chicago ticket now! I love these Hayley!!!! So awesome. I never knew Dove made those candies. Now that I know…dangerous stuff. Ugh, I know. The candies alone taste like s’mores. They are DANGEROUS. So I will NOT tell you you can find them on the baking aisle at Walmart. I mean, whoops. Cinnamon graham chocolates!??!? WHHHHAATTTT!???? Must find these NOW. Jess, I found them on the candy aisle at Walmart, but I’m sure Target would have ’em! They’re Cinnamon Graham Chocolates by Dove. oh those are great looking, I want to try them! How have I never heard of these cinnamon graham Dove chocolates?! I must find these!! I want to stick my face in these! You had me at golden oreos and it just kept getting better. Oh AND I just noticed your YouTube channel for the first time. Great videos! Hayley, I love love LOVE your pictures today! They are fab!! 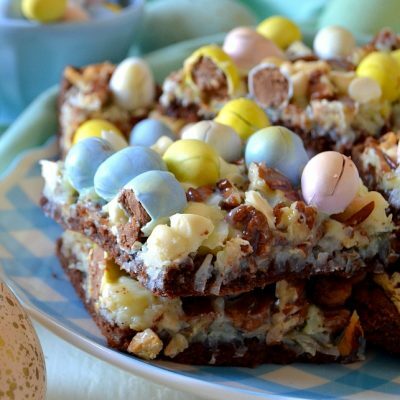 And these bars look amazing–I totally want one or three. And I’m totally intrigued by the cinnamon graham chocolates–must.find.some.immediately. I have to get my hands on these golden oreos! These look amazing! By the way, i’m totally the same way when it’s hot. I find it hard to do anything other than sit around, feel hot, + talk about how hot it is. =) It happens to the best of us! 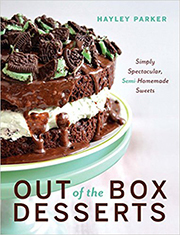 girl, I hear ya on the whole no-bake thing!!!!!!!!!! I’m sorry I missed these babies yesterday, but I’m glad I found them this morning. S’mores are obviously a classic fave of mine. I love these! 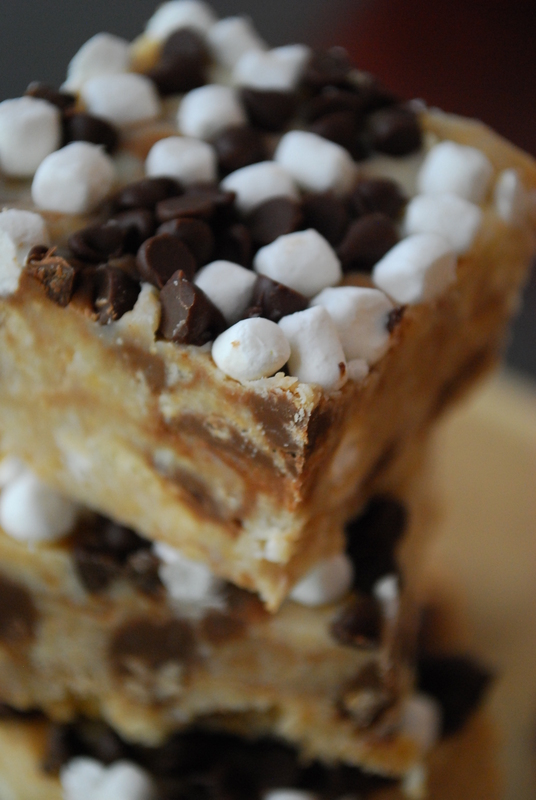 Bars are my favorite thing to bake because they really are thoughtless and SO SO SO easy! 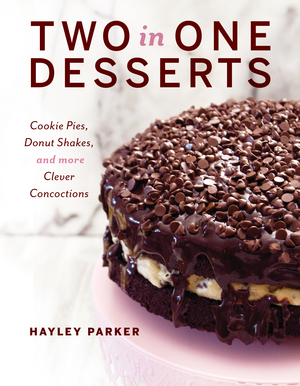 Between these and the cookie dough stuffed oreos, you’re a no-bake queen girl. You are a crazy mad baking scientist and I love it!!! And seriously? Cinnamon graham chocolates? Why haven’t I seen those? I always look for new candies but this bad boy definitely was hiding from me…but not for long. 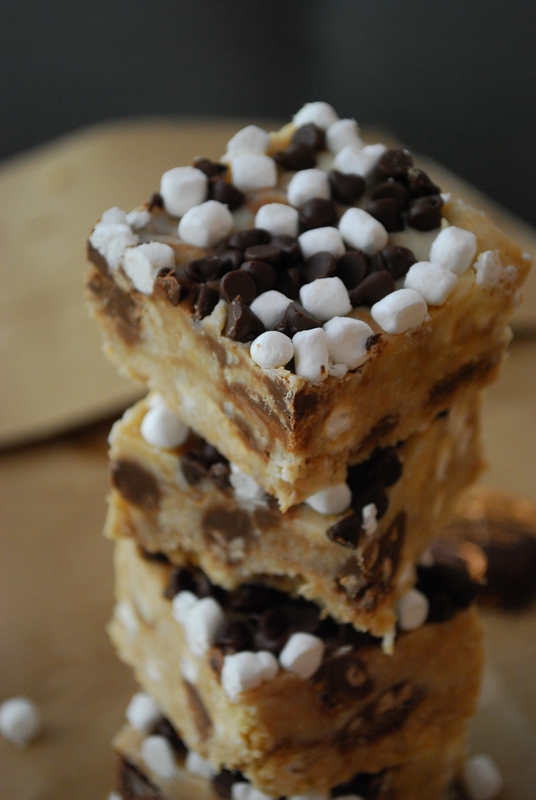 Love love love that you made this recipe into a s’mores version!! So awesome!!! My husband would LOVE these! 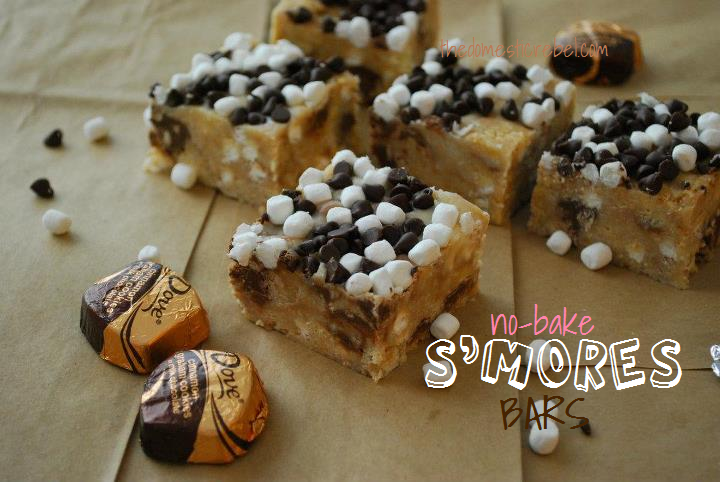 …….well, so would my kids lol, and I love that they are no bake! I’m so sad that I don’t have these ingredients in my cupboard because I really want these right now! Boo, Erin! If I had one to spare, it’d be yours. Maybe this weekend? !